Illustration of the knight from the General Prologue. Three lines of text are also shown. 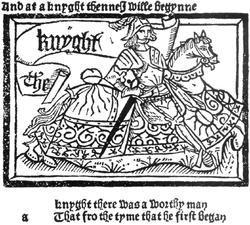 The General Prologue is the first part of Chaucer's The Canterbury Tales. The frame story of the poem, as set out in the 858 lines of Middle English which make up the General Prologue, is of a religious pilgrimage. The narrator, Geoffrey Chaucer, is in The Tabard Inn in Southwark, where he meets a group of "sundry folk" who are all on the way to Canterbury, the site of the shrine of Saint Thomas Becket, a martyr reputed to have the power of healing the sinful. The pilgrims include a knight, his son a squire, the knight's yeoman, a prioress accompanied by a second nun and the nun's priest, a monk, a friar, a merchant, a clerk, a sergeant of law, a franklin, a haberdasher, a carpenter, a weaver, a dyer, a tapestry weaver, a cook, a shipman, a doctor of physic, a wife of Bath, a parson, his brother a plowman, a miller, a manciple, a reeve, a summoner, a pardoner, the Host (a man called Harry Bailey), and a portrait of Chaucer himself. At the end of the section, the Host proposes that the group ride together and entertain one another with stories. He lays out his plan: each pilgrim will tell two stories on the way to Canterbury and two on the way back. Whoever has told the most meaningful and comforting stories, with "the best sentence and moost solaas" (line 798) will receive a free meal paid for by the rest of the pilgrims upon their return. The company agrees and makes the Host its governor, judge, and record keeper. They set off the next morning and draw lots to determine who will tell the first tale. The Knight wins and prepares to tell his tale. 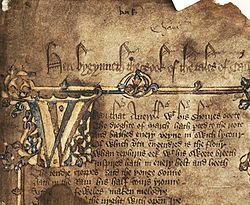 The Tale of Gamelyn intended by Chaucer for The Cook's Tale? The General Prologue establishes the frame for the Tales as a whole (or of the intended whole) and introduces the characters/story tellers. These are introduced in the order of their rank in accordance with the three medieval social estates (clergy, nobility, and commoners and peasantry). These characters are also representative of their estates and models with which the others in the same estate can be compared and contrasted. The structure of the General Prologue is also intimately linked with the narrative style of the tales. As the narrative voice has been under critical scrutiny for some time, so too has the identity of the narrator himself. Though fierce debate has taken place on both sides, (mostly contesting that the narrator either is, or is not, Geoffrey Chaucer), most contemporary scholars believe that the narrator is meant to be some degree of Chaucer himself. Some scholars, like William W. Lawrence, claim that the narrator is Geoffrey Chaucer in person. While others, like Marchette Chute for instance, contest that the narrator is instead a literary creation like the other pilgrims in the tales. Manly attempted to identify pilgrims with real 14th century people. In some instances such as Summoner and Friar, he attempts localization to a small geographic area. The Man of Law is identified as Thomas Pynchbek (also Pynchbeck) who was chief baron of the exchequer. Sir John Bussy was an associate of Pynchbek. He is identified as the Franklin. The Pembroke estates near Baldeswelle supplied the portrait for the unnamed Reeve. 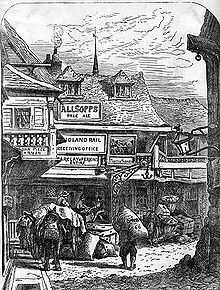 Sebastian Sobecki argues that the General Prologue, in which the innkeeper and host Harry Bailey introduces each pilgrim, is a pastiche of the historical Harry Bailey's surviving 1381 poll-tax account of Southwark's inhabitants. The following is the first 18 lines of the General Prologue. The text was written in a dialect associated with London and spellings associated with the then-emergent Chancery Standard. That hem hath holpen, whan that they were seeke. Who has helped them when they were sick. To give his help to them when they were sick. When April with its sweet showers has pierced March's drought to the root, bathing every vein in such liquid by whose virtue the flower is engendered, and when Zephyrus with his sweet breath has also enlivened the tender plants in every wood and field, and the young sun is halfway through Aries, and small birds that sleep all night with an open eye make melodies (their hearts so goaded by Nature), then people long to go on pilgrimages, and palmers seek faraway shores and distant saints known in sundry lands, and especially they wend their way to Canterbury from every shire of England to seek the holy blessed martyr, who helped them when they were ill.
^ Christ, Carol, et. al. "The Norton Anthology of English Literature: Volume 1," W.W. Norton & Company, 2012. pp. 241-243. ^ Koff, Leonard Michael (1988). Chaucer and the Art of Storytelling. U of California P. p. 78. ISBN 9780520059993. Retrieved 9 October 2012. ^ Sobecki, Sebastian (2017). "A Southwark Tale: Gower, the 1381 Poll Tax, and Chaucer's The Canterbury Tales". Speculum. 92 (3): 630–660. doi:10.1086/692620. ^ This Wikipedia translation closely mirrors the translation found here: Canterbury Tales (selected). Translated by Vincent Foster Hopper (revised ed.). Barron's Educational Series. 1970. p. 2. ^ Gleason, Paul (2002). "Don DeLillo, T.S. Eliot, and the Redemption of America's Atomic Waste Land". Underwords. Joseph Dewey, Steven G. Kellman and Irving Malin. Rosemont Publishing & Printing Corp. p. 131. ^ Sweet, Henry (d. 1912) (2005). First Middle English Primer. Evolution Publishing: Bristol, Pennsylvania. ISBN 1-889758-70-1. "Prologue to The Canterbury Tales" – a plain-English retelling for non-scholars. This page was last edited on 3 April 2019, at 18:14 (UTC).